We are exposed to many toxins on a daily basis through the food we eat and even the air we breathe. Medical experts have stated that this is a major cause for the high number of illnesses in today’s society. Even our body’s own natural detox system is not enough to deal with the toxic load and may not be working as efficiently as it should. This is where detox products have come in and why they have become so popular. 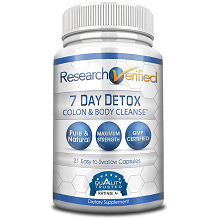 This review will examine the natural detox product Research Verified 7 Day Detox. When looking for a product to help you detox your system, it is important to look for a product that is safe to use and doesn’t contain any harmful ingredients. Cascara Sagrada is a popular ingredient for detox products thanks to its laxative effects. Acidophilus is a probiotic that helps balance the good bacteria that the body naturally produces. Aloe Vera is well-known for its healing properties. Ginger is well-known for reducing inflammation. Senna is also well-known for its laxative properties. Oat bran contains a high amount of fiber which makes it beneficial for avoiding constipation. All of these ingredients have been selected based on clinical evidence to support them for their benefits of detoxing the body and improving digestive health. It is recommended to take 3 capsules a day with a full glass of water. This product should only be taken for a period of 7 days at a time. This product does not specifically mention any side effects, though cascara sagrada should be not taken for a long period of time which makes following the dosage instructions so important. Pregnant and nursing women and those who are taking other medications should speak to their doctor before using this product. Research Verified offers 3 different purchasing options for buying this product online from their website. These packages are also available on Amazon. One bottle will cost $48. The 3-bottle package will cost a total of $98 and the 6-bottle package will cost a total of $142. 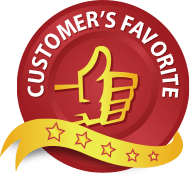 Research Verified offers one of the best guarantees in the industry. If you are not happy with the results of the product, you have an entire year to return it to get your money back. Not only that, you can return both used and unused bottles which really makes your purchase completely risk-free. Overall this product looks like an excellent product to try. Its ingredients are backed by science so you are guaranteed effectiveness and safety and the manufacturer also shows their confidence in the product by backing it up with such an unconditional guarantee.